Camelopardalis is quite faint and spread out, and will be a challenge for those just beginning their study of the stars. But if you've done a number of other constellations, you should be equal to the challenge. Camelopardalis contains Kemble's Cascade, a lovely binocular grouping of stars which flows into a rich star cluster. Alpha Camelopardali isn�t the brightest star in the constellation. Beta Cam has that distinction. But as they are found in the same binocular field, we can deal with them together. The two form part of the front leg of the giraffe. Finding alpha and beta Camelopardali shouldn't be difficult. The northern skies are dominated by two bright stars, Vega and Capella. Capella is the one you want. To find it, start at the tip of the Big Dipper's handle. Move across the dipper to Dubhe, the pointer star. Now keep moving in the same direction you've been going, curving slightly downward and you come to Capella. Now that we're at Capella draw a line to the pole star. Move to the midpoint of this line and you'll find alpha Camelopardali. 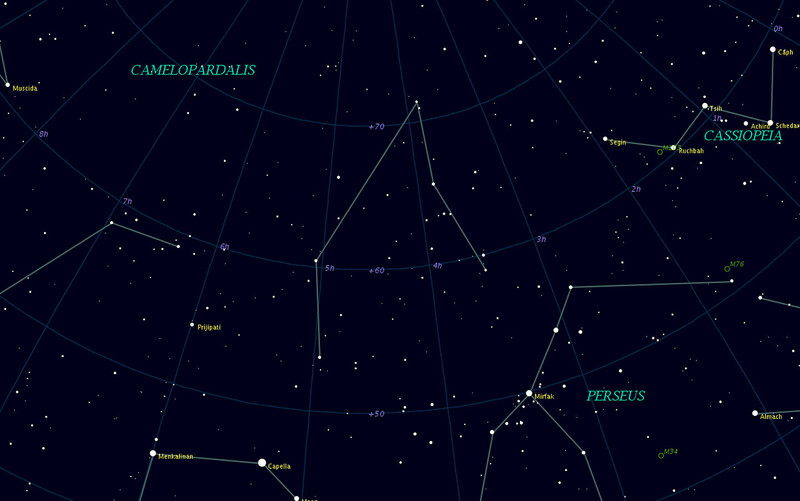 Note that since Camelopardalis is circumpolar, you will probably have to adjust the diagram to have the stars in their proper aspect, with north pointing correctly. Putting alpha and beta at one edge of your glasses, move in a counter-clockwise direction around the pole star two binocular fields. You'll encounter the third brightest star in the constellation, Struve 385.